• The DfT should consider carrying out trials of flashing amber lights at times when there is little traffic, which would allow drivers to proceed with caution at junctions, as is common in countries such as France and Italy. • London trials of a reduction of the green-man phase (the invitation to cross) from ten seconds to six seconds have increased traffic flow by six and a half per cent with no significant impact on safety. In the light of these findings, authorities should consider standardising the green man invitation to cross period at six seconds. • It is not widely understood that the full length of time that pedestrians have to cross is not just the green man period but also includes the time when the pedestrian sign is blank. 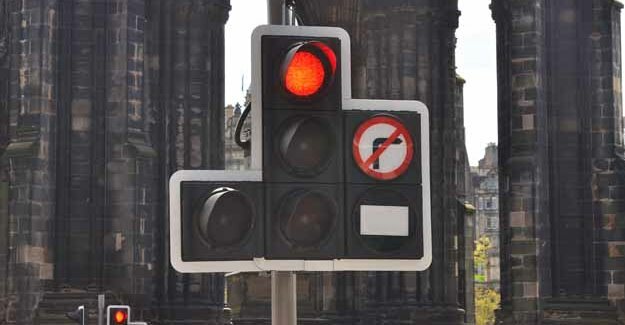 There are other forms of pedestrian signals – Pedestrian User-Friendly Intelligent (puffin) and countdown, currently being trialed at eight sites in London – that avoid this problem. • The DfT should also allow for trialling of cyclists turning left at a red signal. • More use should be made of ‘smart’ traffic lights systems, such as SCOOT, which respond to changes in traffic and congestion by altering the timing of lights. • The most significant change in priorities over the past decade has been for the benefit of pedestrians, with a presumption – since 2005 – that at junctions there will be an all-round pedestrian stage, i.e. all vehicles are held at red whilst people cross. There should be a review of effectiveness of full pedestrian crossing stages and whether the benefits outweigh costs. • Local authorities should review the lights they have and consider whether some could be removed and replaced with alternatives such as mini-roundabouts and shared space schemes, though not at disproportionate cost to taxpayers. “Depending when and where you are, traffic lights can ease your journey or be a source of frustration. It is plain that lights have an important role to play but with ever more congested streets they need to be very finely tuned to ensure they are not doing more harm than good – and that means they must react to changing traffic conditions. The RAC Foundation is a charity that explores the economic, mobility, safety and environmental issues relating to roads and responsible road users. Independent, authoritative research, carried out for the public benefit, is central to the Foundation’s activities. Irving Yass spent thirty-six years in government service, in the Departments of Transport and Environment, ending as Director of Planning and Transport at the Government Office for London. He was Director of Transport and then Director of Policy at London First until the end of 2008, since when he has been working as an independent consultant. Transport for London estimates congestion costs £2 billion a year in London alone. There are no absolute figures for the number of traffic lights in Britain, but the percentage increases are based on data obtained by the DfT from the majority of local authorities including the major urban councils. “ The development of SCOOT (Split-Cycle Offset Optimisation Technique) allowed the phasing of a linked set of signals to respond to changing traffic conditions in real time. In congested urban traffic conditions queues build up very quickly. Fine adjustments to the timing of traffic lights can make a huge difference to traffic flow. Literally, every second counts.